Industrial and commercial facilities handle all sorts of hazardous materials and it is appropriate that the necessary precautions be taken to ensure the safety of all. There exists a variety of standards regulating pipe marking but the basic motivation behind them is the same. There are common labels to be used in labeling pipes in different areas and zones all with the purpose of providing the relevant communication. The labels have intent and purpose of effective communication and it is only prudent that they do so appropriately. The labels should give all the required information and be as detailed as necessary. The basic rule of thumb when it comes to this is that the legends used should be legible but short in length. They should be easy to understand without oversimplifying the message. For example a legend describing the presence of pressure gas should adequately describe the content explicably as well as the danger posed by such content. It is also appropriate that a directional arrow accompany the legend to indicate the direction of flow. In case the flow is bi-directional the arrows should reveal so. Pipe marking standards have to denote the intensity of the risks to ensure safety and to advise appropriately on the level of precautions to be taken by the individuals’ concerned. The standards are also distinct for both underground and aboveground pipes. The hazards are categorized into three. There is the high-hazard material which mostly refers to piping systems transporting highly caustic and toxic substances. These are materials that are explosive, highly flammable, radioactive materials and a collection of all others that would be hazardous due to high levels of pressures and temperatures. It is the onus of an organization to reveal these specifics for the safety and protection of all relevant persons within and outside the facility. The next category is of pipes transporting or containing low-hazard contents which although not absolutely safe, have a mild chance of harming people in the workplace due to the mild levels of pressure and temperature. The third category of pipe marking is used when labeling fire fighting equipments and materials such as foam, water pipes and carbon dioxide. The basic essence of pipe marking is safety. Colors are used distinctly to achieve this and if appropriately applied it creates an environment where all employees are safety conscious. There are six basic colors used in pipe marking and each combination of the colors presents a unique message to be conveyed. The colors red, green, yellow, brown, blue, white and black have varied distinctions and motivations. It is a basic requirement that they be applied consistently to avoid confusion and ambiguity. 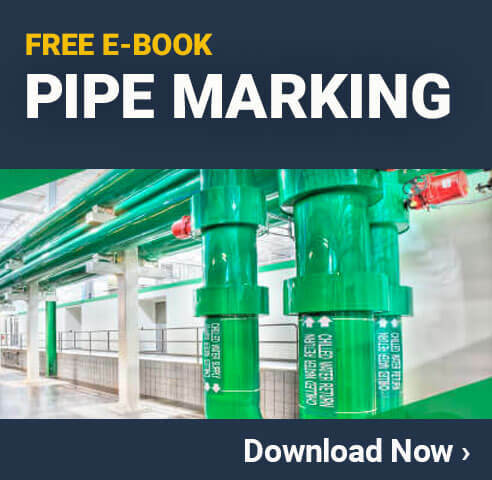 While safety is the key essence of pipe marking order is an incidental motivation that arises from all this and this creates efficiency within an organization. When the message is conveyed effectively and the colors applied appropriately, the workplace becomes orderly and there is a high chance of improved productivity. Next post Arc Flash Requirements : What PPE Is Needed for Each Rating?